After returning to his childhood home, a disgraced children's puppeteer is forced to confront his wicked stepfather and the dark secrets that have tortured his entire life. A supernatural horror combining the stark psychodrama of George A. Romero's MARTIN with the uncanny terror of DEAD OF NIGHT, Sean Harris gives a tour-de-force performance as Philip in this bleak and understated exercise in creeping dread. 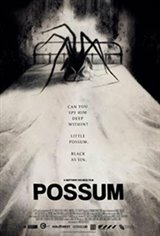 Informed as much by silent cinema expressionism, the British classics THE INNOCENTS and DON'T LOOK NOW, and the claustrophobic suburban Gothic atmosphere of Pete Walker's FRIGHTMARE, POSSUM will terrify in the best shock corridor tradition.